As I was walking to my vegetable garden which is approximately 150’ from my house, I noticed this unusual bird on top of my paired bluebird box. That certain paired box is on a pole with horizontal steel channels and the boxes are 30 inches apart. I have been experimenting with paired boxes and most of them are 10 - 14 ft. apart. noticing something unusual about the nest. On top of the pine needles were some small feathers and a small piece of snake’s skin. I first suspected a tufted titmouse and was waiting to see what kind ofbird was visiting the box. While they were building the nest, there was some real competition between the GCFC and Tree Swallows. The TS were being very aggressive and it looked like they were winning the battle that was going on between them. As I continued to watch this go on, I realized I needed to interfere or I was going to have the TS take over the box and lose the GCFC I took the one paired box that was not being used and moved it approx. 30 feet away from the GCFC box. The TS claimed that box and left the GCFC alone. The nest was made up of mostly pine needles with a small piece of a snake skin weaved into the nest. (might be a trick to discourage predators) There were also some feathers on top of the nest. On June 31 there were 3 eggs in the nest. The eggs are larger than a House sparrow egg, yet in a way they do resemble the HOSP egg. They are moderately glossy, ivory / cream / pink, and densely streaked with fine purple, gray, red, brown, or olive markings, often concentrated on the larger end of the egg. The Flycatcher is olive brown with a pale gray chest and a yellow belly. “phree-e-e-e-e-ep” call usually from high in a treetop. box. 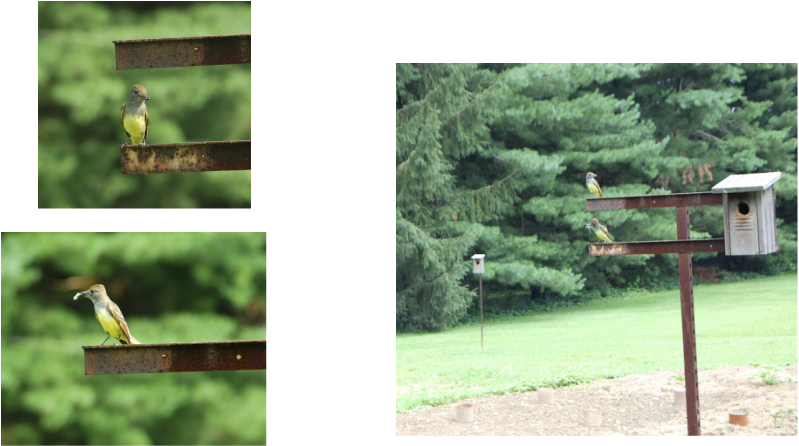 I made a ”blind” approximately 30 feet from the box and got some really good photos of the birds, and photos of insects they were feeding. As far as I know, with the research that I did, there are no records of any GCFC using a nest box in Pennsylvania. beetles, along with wasps, bees, mosquitoes, grasshoppers, crickets, katydids, moths, caterpillars, cicadas, and other insects. Their diet also consists of various berries such as mulberries, poke berries, blackberries, wild grapes and others. on the outside of this box definitely helped this little chick re-enter the box. I continued to watch, hoping to see them fledge, but they did not fledge until the following day, which missed. Three eggs were laid as of May 31. Three chicks fledged on June 29. Upon examination of the nest after they fledged, it looked very much like a bluebird nest after fledging. It consisted of matted down pine needles and the feathers that were there after the egg laying were gone. any GCFC using a nest box in PA. An interesting item he said was that these birds will often return to the same nesting site year after year. How “lucky” would I be if this special nesting would happen again! As I reflect on this nesting experience I cannot help but think about how similar these eggs resembled the dreaded House sparrow egg. Wondering how many folks would see this nest and eggs and suspect they were HOSP eggs and toss them out. As a precaution, always make sure that we correctly identify the eggs and the species using the nest box before we toss any eggs out. So what is next??? Do we build larger cavity nesting boxes with a larger hole and try to attract these birds?? I do plan to build a box to encourage them to return next year. Recommended size is a 6-7 inch square floor. 12-18 inches deep with an entrance hole of at least 1 3/4 inches. Mounting height is 6-24 feet. Per Bet Zimmerman’s bluebird web site, http://www.sialis.org Phil Berry in Florida has had a number of GCFC nest in boxes with a 1 ½ inch hole. cavity- nesters, they must compete with Starlings and Flickers and other cavity nesters for breeding sites. Proper placement of nest boxes will likely help these birds recover to previous population levels as long as Starlings and Flickers do not take them over. Nest Box Adventures Contact our Webmasters with your story with Nest Box Adventure.